Granite School district administrator and teacher, Ernest Angelo Pizza, 64, died Thursday, July 24, 1980, at his home 2870 Wanda Way, Holladay, from natural causes. 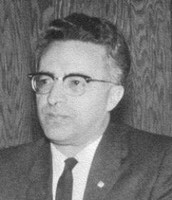 Mr. Pizza was the principal of Woodstock Elementary School, Granite Junior High School before becoming the first principal of the newly opened Skyline High School in 1962. He held that position until 1978, when he was appointed Director of the East Valley area of the Granite School District. He was graduated from the University of Utah with a degree in Spanish in 1936. He taught in the Carbon School District then served in the United States Army from 1942 until he was released as a Captain in 1946. Ernest was born November 23, 1915, in Clear Creek, Carbon County, to Ralph and Angelina Romano Pizza. He married Berma Jeanne Spackman. She died. He married Alice Stock McMullin on July 17, 1956 in Elko, Nevada. Mr. Pizza is survived by his wife, Salt Lake City; sons and daughters, Gregory, Stamford, Connecticut; Jerry McMullin, Salt Lake City; Mrs. Michael (Linda) Lambert, Provo; and Mrs. Michael (Marian Jean) Haberberg, Elk Mound, Wisconsin. He is also survived by brothers and sisters, James, Portland Oregon; Ralph, Denver, Colorado; George, Helper, Utah; Mrs. Mary Marta and Mrs. Della Lloyd, both of Oakland, California; Mrs. Victor (Molly) Nielsen, Mrs. Anita Deyo and Mrs. Arch (Vera) Thurman, all Salt Lake City. 12 grandchildren survive Mr. Pizza. Funeral Services will b e held Monday noon at 260 E. South Temple, where friends may call Sunday from 6:00 to 8:00 p.m. and Monday one hour prior to the services. Interment will be in Wasatch Lawn Memorial Park.